Total value of all prizes is $79,550.22. Only 2,000 tickets available. Ticket purchasers must be physically in Province of Ontario at time of ticket sale. Purchasers must be at least 18 years of age. Tickets cannot be purchased in the name of persons under the age of 18 years. Post-dated cheques are not acceptable. Only tickets that have been verified as paid for are eligible for the draw. The official ticket is receipt of purchase. Tickets ordered by mail should be delivered to the purchaser within three weeks of posting the mail order. Direct inquiries about status of tickets ordered by mail to info@CorvetteLottery.com. Members of Rotary Club of Wasaga Beach and Area, and management and staff of Mike Jackson GM dealership in Collingwood, Ontario are ineligible to purchase tickets. Tax receipts cannot be issued for ticket purchases. Tax receipts cannot be issued for ticket purchases. Details about winning tickets will be announced in Wasaga Sun newspaper as soon as practicable after each draw. Early Bird Cash Prize Draw: Draw prize is $1,000.00 cash. Draw occurs at 6:00pm on Tuesday July 3, 2018 at Home Hardware parking lot, 1955 Mosley St., Wasaga Beach, Ontario. Cash, credit and debit card orders not accepted at draw site after 5:55pm. Mail order purchases must be received before 12:01am on June 26, 2018 to be eligible for draw. Ticket purchase transactions paid by cheque must be completed before 12:01am on June 26, 2018 to be eligible for draw. All tickets stubs included in the early bird prize draw, including the winning ticket stub, will be included in the main draw. Early bird prize winner will be paid by cheque delivered by a Club representative or sent by registered mail to the winner within 10 days of the draw. 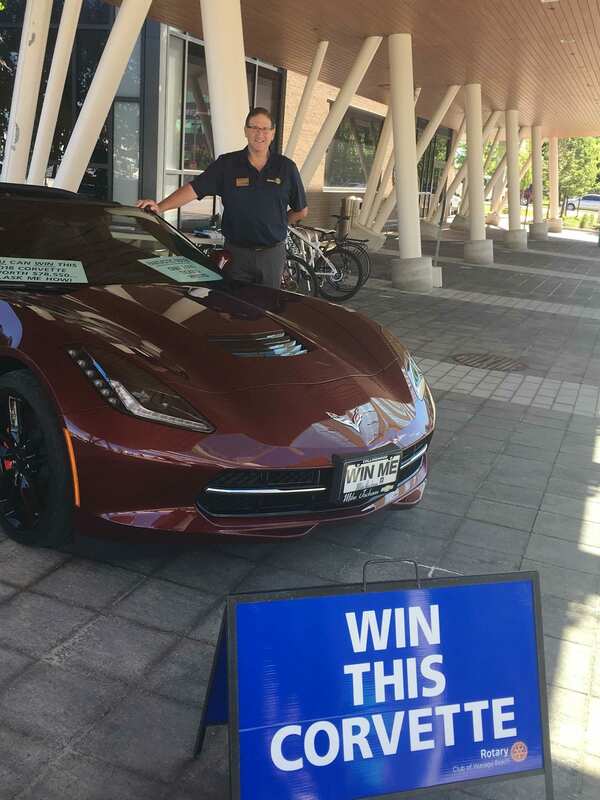 Main (Corvette) Draw: Draw prize is a 2019 Chevrolet Corvette valued at $78,550.22. Draw occurs at 2:00pm on Saturday September 29, 2018 at the Wasaga Beach RecPlex, 1724 Mosley St. Wasaga Beach, ON, L9Z 1Z7. Cash, credit and debit card orders will be accepted at draw site only until 1:55pm. Mail order purchases must be received before 11:59pm on September 22, 2018 to be eligible for draw. Purchase transactions for tickets paid by cheque must be completed before 11:59pm on September 22, 2018 to be eligible for draw. The Corvette prize is awarded on an unconditional ownership basis inclusive of all taxes, freight charges, pre-delivery inspection (PDI) costs and dealer fees. The winner of the Corvette must take delivery of vehicle as awarded and is responsible for licensing and insurance from the time of delivery/ownership. Delivery of the vehicle is P.O.D., Collingwood, Ontario. Personal information collected for purposes of completing ticket orders, satisfying AGCO lottery regulations and informing purchasers about future Club lotteries. Personal information will not be communicated to any other parties in whole or in part. Check off appropriate contact notification box on ticket request form or ticket stub to be excluded from lottery contact list.